In present-day Hopewell, an adult Kosh Feye discovers a sweet and painful piece of his past when he’s rescued by the Lamb Emma. In a far distant future, Tucker Feye and the inscrutable Lia find themselves atop a crumbling pyramid in an abandoned city. And on a train platform in 1997, a seventeen-year-old Kosh says good-bye as his brother, Adrian, leaves for a pilgrimage to the Holy Land. Before Adrian boards, he asks Kosh to take care of his fiancée — the most beautiful girl Kosh has ever seen. 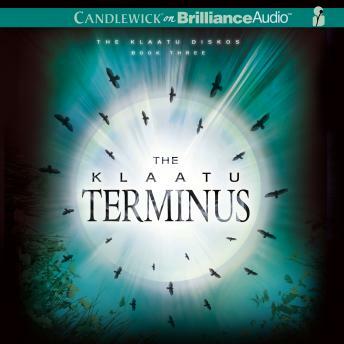 The final book of Pete Hautman’s highly praised Klaatu Diskos trilogy, The Klaatu Terminus weaves together these fragmented timestreams in a heart-stopping chase to the edge of time as Tucker, Lia, and Kosh must search for one another and finally puzzle out the secrets of the diskos. Who built them? Who is destroying them? And, most of all, where — and when — will it all end?